2. Find yourself 2 large cookie sheets. Line them with parchment paper and spray it with cooking spray. 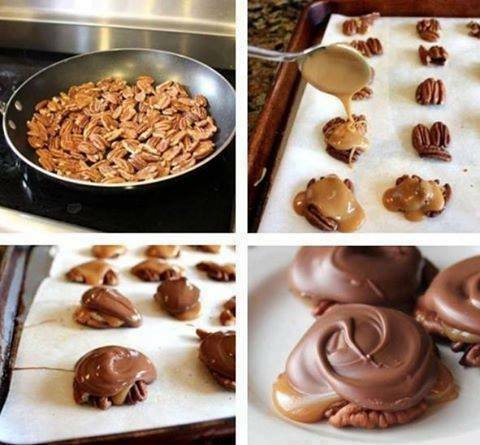 Arrange your pecans into clusters, three to a group works well. You want to leave some space (about an inch) between each cluster. 3. Make your caramel (full tutorial with pictures found here). Place 1/2 C butter into a medium-sized sauce pan. Melt it over medium high heat. Add 1 C brown sugar, 1/2 C light corn syrup and 7 ounces sweetened condensed milk to the pan. Increase the heat just a bit and stir it continually. Cook and stir until it reaches 235-240 degrees. I generally remove it from the heat when it reaches about 234 degrees. It will continue to rise in temperature just a bit even without the direct heat, making the caramel just the right texture. 4. Stir in 1/2 teaspoon vanilla. 5. Carefully drizzle about 1 1/2 teaspoons of caramel over each nut cluster. You’ll want to work quickly, as the caramel will begin to set up. Be sure there is caramel touching all of the nuts in your cluster. The caramel works like glue, sticking the nuts together. 6. In a microwave safe bowl pour 12 ounces of milk chocolate chips. Heat in the microwave for 30 seconds at a time, stirring after each cooking interval. 7. Add 1/2 teaspoon of shortening to the melted chocolate. Allow it to sit for a minute or two (so it can melt and make the chocolate chips more spreadable). Stir it all together. 8. Spoon about 1 1/2 teaspoons of melted chocolate over the top of the caramel and nuts. Swirl it around along the top making a pretty swoop with your spoon. 9. Allow the chocolate to set up. Once it has hardened and cooled you can serve them immediately, or transfer them to an air tight container.